After you’ve been running Outlook for some time, you may feel that your inbox is cluttered and could benefit from a Spring clean. 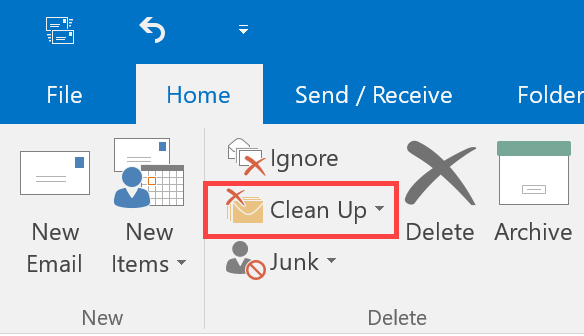 Outlook’s integrated Clean Up tool removes messages from your email folders that you no longer need. To use it, select Home > Clean Up. Clean Up Conversation– delete redundant email messages from a selected conversation. Clean Up Folder– delete redundant email messages from a selected folder. Clean Up Folder & Subfolders – delete redundant email messages and conversations from Inbox and any other folders.